Vitamin B-12 Gold features a biologically active complex of B12 as methylcobalamin and adenosylcobalamin formulated with an organic, sprouted, whole-food blend. Sprouts are nutritionally complete foods that provide a natural source of digestive enzymes to support optimal vitamin and mineral absorption. Vitamin B-12 Gold is Non-GMO Project verified, manufactured to quality standards that far exceed current GMPs and is verified by independent, third-party labs to meet identity, purity, and potency label claims. Vitamin B-12, also called cobalamin, is a water-soluble vitamin that helps support optimal brain and nervous system health and assists in the formation of red blood cells. It is one of the eight B vitamins and is involved in the metabolism of every cell of the human body including DNA synthesis and regulation, synthesis of fatty acids, and energy production. There are four forms of vitamin B12 and they are differentiated by the side group attached to the cobalamin molecule — adenosylcobalamin, cyanocobalamin, hydroxocobalamin, and methylcobalamin. Methylcobalamin and adenosylcobalamin are the two forms of B12 that are coenzymated and active within the body, and they perform different functions within the body. Methylcobalamin is predominantly found in blood plasma, cytosol cells, and certain body fluids (like cerebral spinal fluid). It works directly within the cells, where it is responsible for the reactivation of folic acid (folate). Methylcobalamin also helps break down homocysteine, an amino acid and byproduct of protein metabolism, that can adversely impact heart health. Methylcobalamin is also a precursor of S-adenosylmethionine (or SAMe), the most important methyl donor in the body. Overall methylcobalamin supports cardiovascular function, neurological health, and emotional wellness. Adenosylcobalamin is found in cellular tissues where it is stored in the mitochondria, which are the ‘energy centers’ in the body. 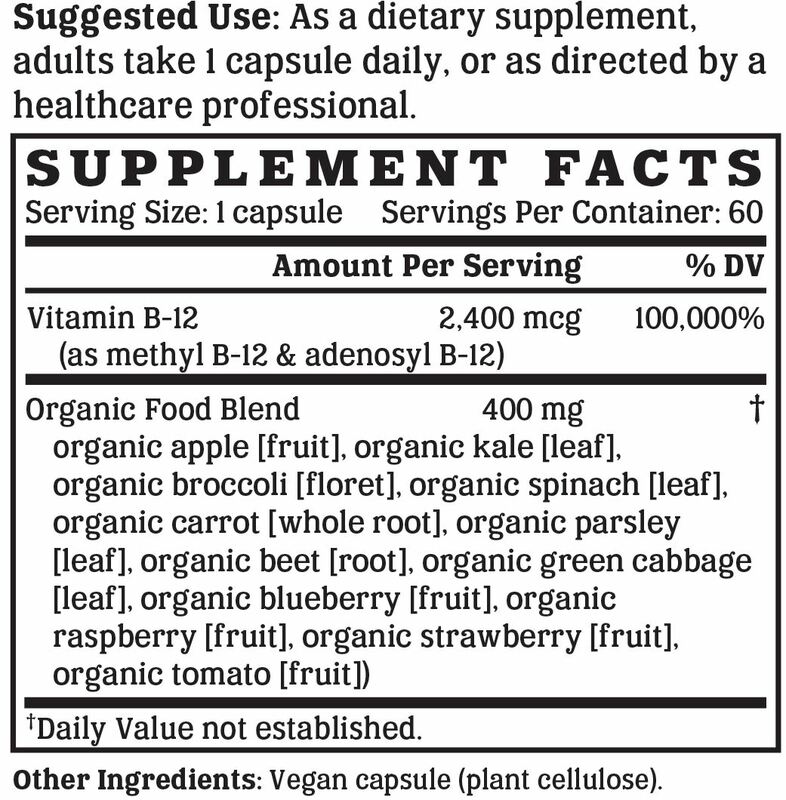 Most of the B12 reserves are actually stored in the liver as adenosylcobalamin, and are converted to methylcobalamin as needed.In addition to being implicated in the metabolic cycle for the production of energy, adenosylcobalamin supports optimal liver health and plays a vital role in carbohydrate, fat and protein metabolism. Vitamin B-12 Gold is Non-GMO Project Verified, which provides assurance that the product has been manufactured in accordance with the best practices for GMO avoidance. The Non-GMO Project is North America's premier verification program. Vitamin B-12 Gold is certified organic by SCS Global Services. An official partner of the USDA, SCS Global Services certifies products that contain between 70% and 95% organic ingredients. Vegan Action has offered vegan certification since 1995. Their official seal is proof that Vitamin B-12 Gold does not contain ingredients derived from animals or animal by-products, is free of animal-derived GMOs or genes, and is not the subject of ongoing animal testing. Most consumers consider kosher products to be cleaner, healthier, or better than non-kosher products. The Ko Kosher symbol on Vitamin B-12 Gold is assurance of our brand's unwavering and uncompromising commitment to accountability, quality, and overall safety. We like to make supplements that can be enjoyed by everyone. That's why our products are always compliant with the best practices for avoiding allergens and minimizing cross-contamination. Vitamin B-12 Gold is free of soy, gluten, egg, milk, peanut, shellfish, and corn allergens. Consistent with our guiding principle to “do no harm,” Vitamin B-12 Gold is manufactured without the use of additives or preservatives. It contains absolutely NO contaminants, pesticides, herbicides, harmful additives, residual solvents, magnesium stearate, or hexanes. Like all NutriGold products, Vitamin B-12 Gold is subject to over 140 purity and potency assays by independent, third-party labs to ensure that the product meets or exceeds its claims. So, you can be certain that what's on the label is what's in the bottle. Nothing more, nothing less. No articles featuring Vitamin B-12 Gold have been published yet.